Fancy horror and spooky moments? You are in for a treat! 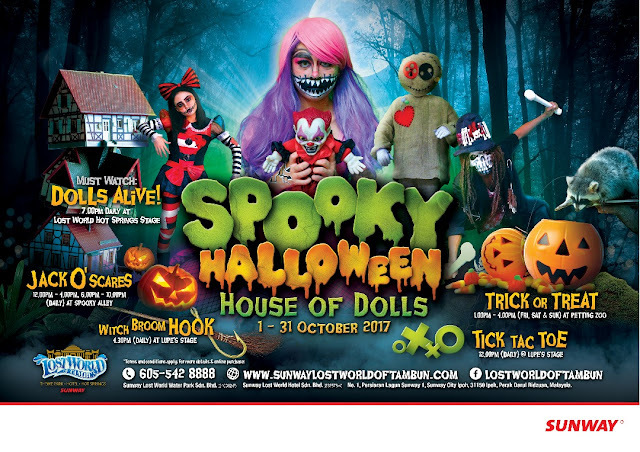 Make your way to Lost World Of Tambun this October to feast on scary movies to folk tales and doll characters coming to life! After all, where’s the fun without some terror or spook moments? As a popular holiday adventure destination for families and friends across generations, the Lost World Of Tambun (LWOT) is leaving no stone (or pumpkin) unturned to ensure a befitting month-long celebration unlike any other. Visitors to LWOT throughout the month of October can expect a host of activities, games and prizes galore suitable for revelers of all ages, from little ones right up to their grandparents! Dare yourself to come and feast your eyes on the House Of Dolls show which is one of the main features in LWOT this year. The show’s plot revolves around Sebastian, a passionate 64-year-old doll collector who lives alone deep in the woods. One stormy night, a couple, Jack and Audrey, seeks shelter in Sebastian’s home after their car breaks down. All is well, with Sebastian playing the perfect host, until Jack begins to insult his dolls, who then come to life, refusing to allow the guests to leave. How does the story unfold and end? – Check this out yourself this October! It won’t be all spooky and scary as LWOT has lined up a variety of fun and games (with attractive prizes to match!) for the whole family. These include Tic Tac Toe tournaments, a fishing game, the Pumpkin Memory Challenge, a marshmallow singing challenge, a witch ring toss game and other fun games. Of course, no Halloween celebration would be complete without good ol’ Trick or Treating and this is on the cards as well, with a lot of candies and goodies to be collected such as Pocky and Eclipse. 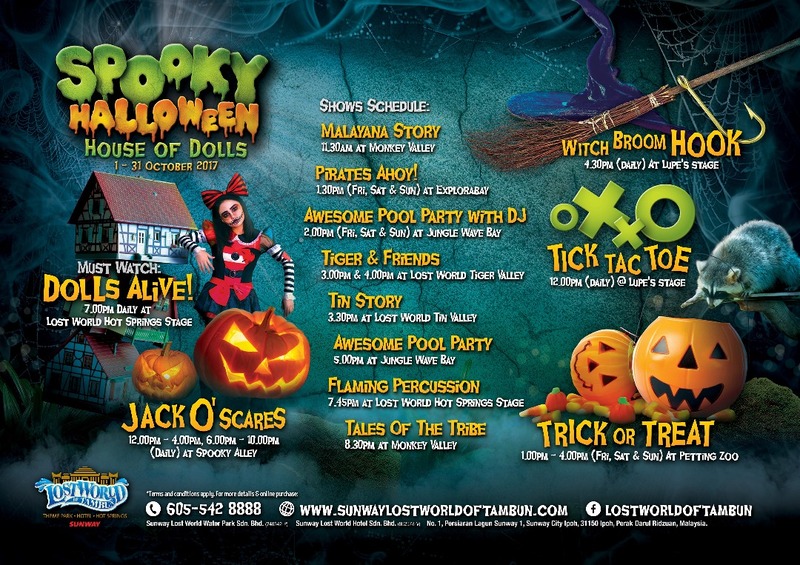 “Lost World Of Tambun will certainly take on a carnival atmosphere of sorts this October with something going on in every nook and corner of the park with heaps of spooky fun and entertainment for all ages! We really encourage family and friends not to miss this as it is our hope to share the uniqueness of Lost World Of Tambun with our guests and be the place to have a fun-filled day. That’s why we’re pulling out all the stops this year, with a few ‘tricks’ up our sleeve to give our visitors a true ‘treat’ they’ll remember for a long time to come,” says Calvin Ho, Senior General Manager of Sunway Theme Parks. Social media junkies are not left out of the fun as well as there’ll be loads going on online, including weekly pranks and video teasers, among other initiatives. More exciting than that, is Spooky Feast with Celebrity where you may stand a chance to win a spooky dining experience with a mystery local celebrity – completely in the dark. Each online purchase of one adult entrance ticket will get a FREE entrance to the Lost World Haunted Chamber. 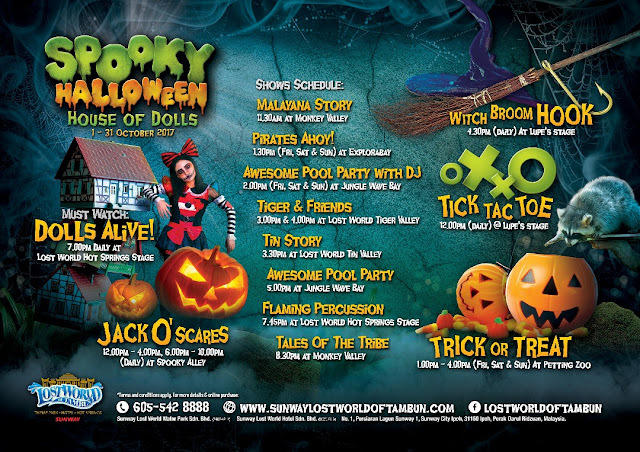 So head on down to Lost World of Tambun in Perak for a Spooky Halloween celebration for the whole family unlike anything seen before. More information can be found by logging on to https://sunwaylostworldoftambun.com/product/spooky-halloween/ or by calling 605-542 8888.